Californian Kelly Myers has been dreaming of a postcard perfect holiday in Oyster Bay with her newfound family, but no one ever prepared her for a blizzard, or warned her that the cottage she is renting doesn’t exactly have a reliable furnace. Still, she’s determined to make this New England Christmas the best one ever, complete with gingerbread houses, stocking stuffers, and all the other things she missed out on growing up…things that her half-sisters don’t seem to have any time for now. 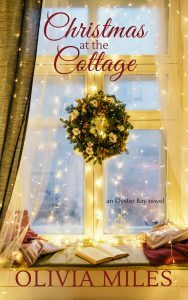 When the cottage’s caretaker makes it known that the old house will soon be torn down, Kelly decides to make him an offer he can’t resist—first, she’ll have to help him find his Christmas spirit. But as the days pass and her hopes for the holiday begin to dwindle, Kelly discovers that there’s more to this small town than she first thought, and that it could just turn her back into a believer after all.